The Humphries Lab is rolling right through these strange New England winter weather patterns and into the Spring 2019 semester! As per usual, this semester will see our group increase in size, travel across borders in the name of sustainable fisheries, and expand our minds, teaching skills, proposals, and scientific pubs! All the activity is seriously invigorating, and this upcoming semester should be a time of lots of hard work paying off for all of us. Read on for specific updates on each lab member! Austin kicked off the new semester abroad on the Kenyan coast, getting the new USAID project named #SecureFish up and running. The project will identify conditions under which local fisheries could improve provisions of vital nutritional resources to pregnant women and young children in local communities while also sustaining marine ecosystem functioning. Austin spent 3 weeks in Kenya meeting with collaborators and local community members to establish protocols for data collection. Austin will be busy this semester teaching an Ecosystem-Based Fisheries Management course, mentoring students, and overseeing so many other research projects that really he needs his own separate blog post to cover it all. Annie, our newest Humphries Lab member, is quickly getting oriented to her graduate program and diving into a packed class schedule that covers ecosystem-based fisheries management, big data analysis, marine protected area (MPA) management, and of course graduate seminars! She’ll be spending the semester getting going on her work with the RI C-AIM group modeling the Narragansett Bay social-ecological system. Celeste has been hard at work contributing to the maintenance of a horde of kelp babies in their aquaculture nursery and helping to oversee their deployment at sea to grow and provide data for her kelp growth model. Celeste is working with her collaborators to parameterize the kelp model and will be teaching an undergraduate recitation course on introductory ecology. Elaine has been working on the construction of a data analysis work-flow protocol for environmental DNA (eDNA) sampling in Indonesia and helping to lead programming as a part of the student-led CELS department Professional Learning Community (PLC), including a panel she recently co-moderated on social responsibility and equity in STEM. This semester she will be working on developing her proposal and teaching an undergraduate herpetology course. Elle is back stateside after many months in Bali working through data and writing her first manuscript. She presented her research at the 5th International Marine Conservation Congress meeting in Malaysia and participated in the Youth Summit during the 2018 Our Ocean Conference in Bali. This semester Elle will be preparing for comprehensive exams and teaching and grading for multiple undergraduate courses. Evans has his eyes set on a Summer 2019 graduation. He has his work cut out for him finishing up data analysis, polishing off his dissertation chapters, and preparing to defend his dissertation on sustainable management of the Ghanaian sardinella fishery. Meanwhile, Evans has also discovered the secret to reversing hair loss. No joke. But we do ask that you hold all requests for information on this front until after his successful PhD defense. Kelvin has already been busy expanding his professional toolkit by participating in various workshops early this semester, including the 2019 SABER West conference on STEM education research and a National Institute for Mathematical and Biological Synthesis (NIMBioS) workshop on network modeling. Kelvin will continue this semester lending his expertise to various projects in the lab, such as the RI EPSCoR C-AIM effort to build an end-to-end model of the Narragansett Bay ecosystem and working with socioecological fisheries data from Wakatobi, Indonesia, to understand management tradeoffs. 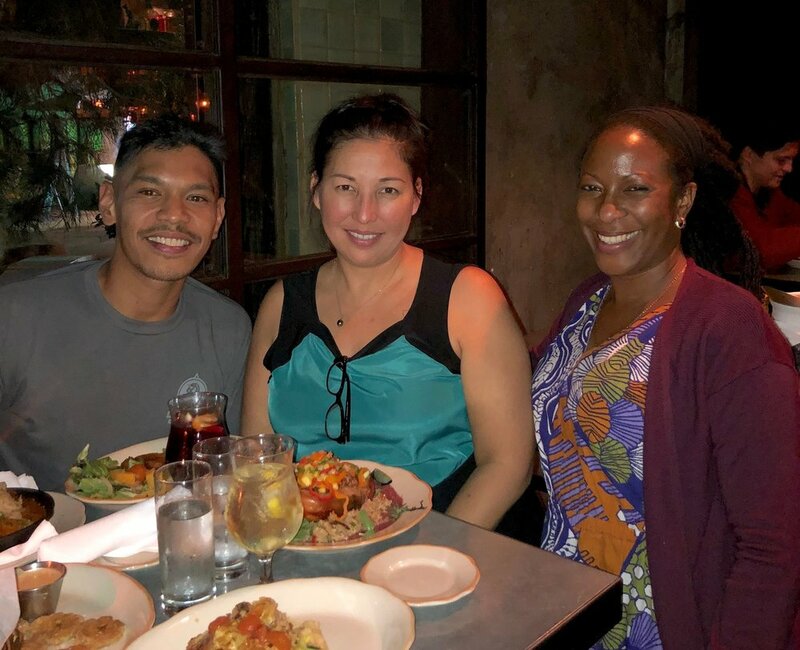 Kelvin reunites with a research mentor and former graduate school classmate from University of Hawaii for dinner after the SABER West conference. Lauren will be spending the upcoming semester overseeing the usual wide range of research activities, from data visualizations to travel coordination to drafting manuscripts. A couple of the major projects that will be occupying Lauren’s attention in the coming months include finalizing a data matrix of Narragansett Bay fish diets for input into the ecosystem model being developed by the RI C-AIM modeling group, and handling data coming in from the USAID #SecureFish project examining marine resources in Kenya as a solution to local nutrition insecurity. Melati will be busy this semester working to finish analyzing fish landings data and market networks from our Wakatobi, Indonesia, field site. Melati expects to graduate in May. Melati and research collaborator Professor Wa Iba of Universitas Halu Oleo celebrate one year of successful data collection with a fish fry. Paul conquered his comprehensive exams and is now enjoying working as a teaching assistant for both marine ecology and intro to biology undergraduate courses. Paul is also wrapping up his SESYNC graduate pursuit research on the impacts of hurricanes on coastal socio-ecological systems. His major goal this semester is to complete the first chapter of his dissertation and get his manuscript on periodically harvested fisheries closures published. As always, stay tuned for highlights before classes wrap up and we break for the summer field season! Wait, it’s summer time already?! Austin (PI) has his hands full mentoring students, and teaching 2 sections of URI’s ‘Food from the Sea’ course while helping to launch the AquaFish Innovation Lab, a giant new USAID funded research partnership that will look into opportunities to use seafood to improve food security. Austin is serving as the East Africa Director on the project and will work closely with Washington University in St. Louis, Pwani University and Egerton University to lead research efforts in Kenya. This is just a flavor of the many, many on-going projects Austin is working on. Kelvin (post-doc) has been working and succeeding on learning Ecopath modeling to assist in his work building a socio-ecological model of Narragansett Bay for the NSF EPSCoR Rhode Island Consortium for Coastal Ecology Assessment, Innovation and Modeling (C-AIM) effort. Kelvin and Austin attended an intensive 5-day Ecopath workshop at the Center for Marine Sciences at Universidade do Algarve in Faro, Portugal in early November. Postdoc Kelvin Gorospe and PI Austin Humphries doing the obligatory group photo at the Ecopath workshop in Portugal. Lots of computer time trying to balance models. 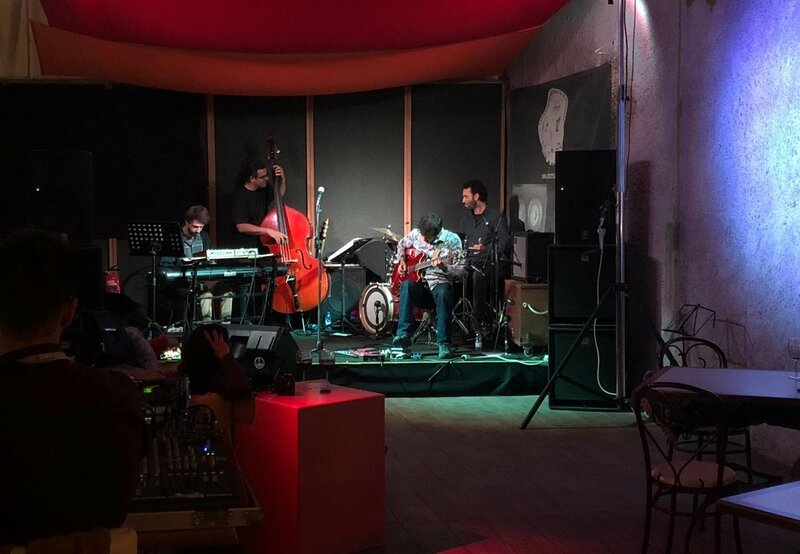 Live experimental jazz was a highlight of Faro, Portugal. Checking out the local seafood dishes. This is a traditional dish called cataplana. Diana (postdoc) is being kept nice and busy teaching URI’s Fisheries Science (AFS 415) course. Class topics cover the foundations of aquatic species as resources, including fisheries ecology, management, and farming. Lauren (research associate) started the Fall 2018 semester fresh back from a trip to Bali where the Humphries Lab was able to secure additional funding to continue monitoring the impact of a new coral reef restoration method on local small-scale fisheries activity. Lauren will also help Kelvin to develop curriculum for a week-long teaching module on seafood traceability in Austin’s ‘Food from the Sea’ course this Fall. Research Associate Lauren Josephs with URI collaborators Amelia Moore and PhD student Jess Vandenberg pose for a group photo at the end of the Mars, Inc. coral reef restoration workshop in Bali. 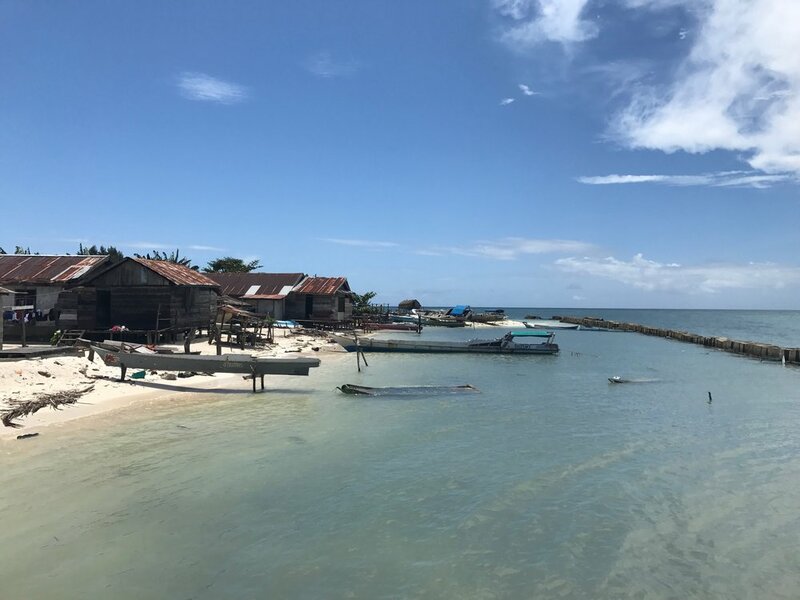 Evans (PhD student) is back from 8 months in Ghana, where he spent time finishing up his data collections on the Sardinella fishery in his home country. Evans is now prolifically producing figures, tables, and models of his data (learning a lot of “for” loops in R), writing up his first manuscript, and aims to graduate in 2019. Paul (PhD student) has finished up his fieldwork in Indonesia during which he has logged an impressive 100+ dives over just a few years. Paul recently got his dissertation proposal approved and is now deep in the dark pit that is studying for comprehensive exams. We all miss him and eagerly await his return to the land of the non(read:less)-stressed. Elle (PhD student) is working from Bali, Indonesia, this semester where she is writing her dissertation proposal and contributing to on-going fieldwork with The Nature Conservancy. Elle is also putting together a manuscript on updating the life-history parameters for the top-50 species in the demersal snapper-grouper fishery in Indonesia, and received a fellowship to take part in the Youth Leadership Summit at the Our Ocean 2018 conference in Bali. 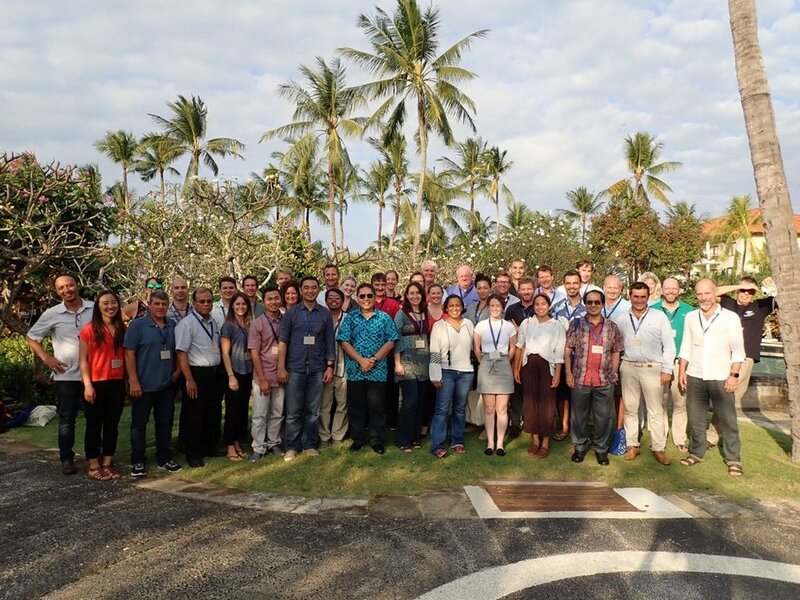 PhD student Elle Wibisono at the 2018 Our Ocean conference in Bali, Indonesia. Officials discuss future tasks for achieving sustainable fisheries management in Indonesia during the Our Ocean 2018 conference. Sculptures crafted from plastic trash decorate the halls of Our Ocean 2018. Celeste (MS student) was able to travel to Moncton, Canada, with Austin to meet Dr. Romain Lavaud to check on his sea lettuce growth model and gain insight for her own kelp dynamic energy budget model for her Master’s thesis research on integrated kelp aquaculture. Celeste is helping to keep a blog on the larger NOAA-funded project that you can see here. She is also writing up her proposal, finishing up required courses, and learning to code in Python - she has already conquered Matlab and R.
Melati (MS student) is wrapping up data collection for her Master’s research. She spent the summer in Indonesia with collaborators completing the data collection process for her investigation of the market-chain from the coral reef Indonesian fishery in Wakatobi. Melati also oversees data collection on fish landings in Indonesia, and is being kept busy by her teaching assistantship on URI’s main campus. Elaine (PhD student) Elaine (PhD student) is diving into her own required classes while also teaching three recitation sections for Intro Ecology. She was sponsored by the graduate school to attend the #InclusiveSciComm Workshop hosted by the Metcalf Institute here at URI and is busy thinking about research and outreach ideas that integrate what she learned. Elaine having no problem whatsoever holding the attention of her students as she taught one of her Intro Ecology recitation classes on Halloween. Last but not least, the whole crew is looking forward to welcoming new MS student Annie Innes-Gold to the lab to study social-ecological modeling of the Narragansett Bay system this upcoming Spring 2019 semester! Stay tuned for another productive year of building solutions to complex trans and interdisciplinary coastal problems from this excited and exciting group of individuals! 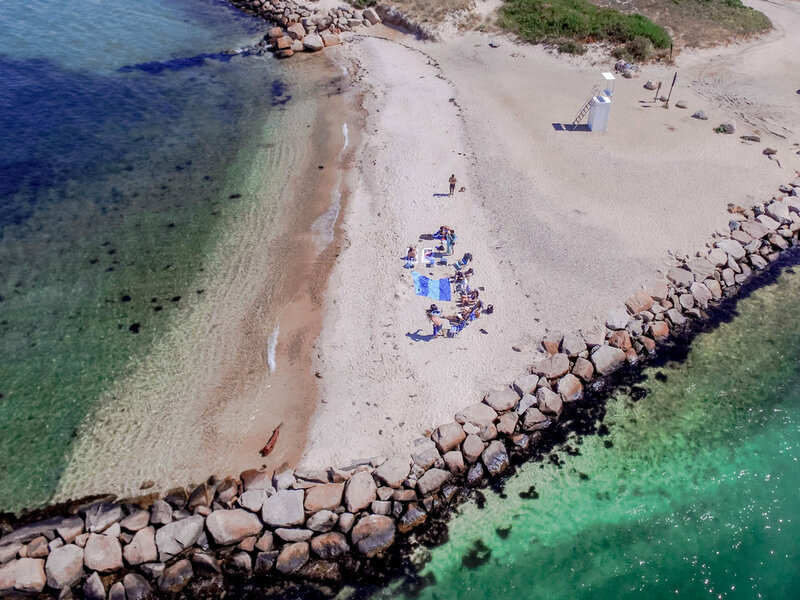 Drone shot of the lab group during the inaugural Humphries Lab retreat in Martha’s Vineyard, MA. Happy field season everyone! Just a quick update on what this marvelously giant group of researchers will be getting up to this summer. Austin will be around helping students get organized and set for their field work trips, as well as getting some writing done and manuscripts submitted. He’ll be working on a hydroacoustic project with menhaden in Narragansett Bay collaborating with RI Dept. of Environmental Management, Jeremy Collie at GSO, and welcoming the talented Corinne Truesdale (MS student) to the lab group for the summer to work on the project. Austin will also be spending a month doing field work in Indonesia and setting up more teams to collect fisheries data on small islands. Lauren will be helping to manage student travel and tie up loose ends within the bounty of research projects the lab is orchestrating this field season. Lauren will also be traveling to Bali towards the end of the summer to meet will collaborators to discuss progress on our big coral reef ecosystem restoration project with Mars Symbioscience and Hasanuddin University in Indonesia. Celeste will be working in Point Judith Pond and Narragansett Bay monitoring oyster growth and working on dynamic energy budget (DEB) models for kelp and oysters. Celeste and Austin will also be traveling to Canada to meet with an awesome DEB modeler. Katie will be spending the first part of the summer in full-on defense prep mode. She’ll spend the rest of the warm months volunteering on a number of shark-related projects with NOAA Fisheries, working on a shark diving boat, and setting out on the job hunt. Diky will be defying logic by celebrating the month of Ramadan, prepping to pass in and defend his Master’s thesis, and probably still fueling the rest of the lab with amazing home-cooked Indonesian food all at the same time. Catie Alves is joining the Humphries Lab family this summer as a visiting PhD student from the University of North Carolina at Chapel Hill, studying with Dr. John Bruno. She’ll be around campus writing up her first dissertation chapter for publication, which documents 20 years of coral reef community changes along the Belize Barrier Reef. She’ll also be preparing for comprehensive exams with mountains of reading. (So far) Kelvin will be working on two projects, splitting his efforts between Narragansett Bay and Indonesia. For Narragansett Bay, he’ll be leading a review paper on the rich history of models that have been used to study the physical, biological, and/or socioeconomic ecosystem components of the bay. And for Indonesia, he’ll be focusing on the small-scale fisheries Lombok, analyzing their catch data to look for patterns that could be informative for ecosystem-based fisheries management. Last but not least, Kelvin will be cutting his teeth (read: his canines) as a brand-new dog-daddy with his recently adopted cairn terrier named Kelly! Diana continues to plug away at a review paper on what we know globally about coral reef fish genetic diversity. This requires lots of database and code wrangling behind the computer screen. Melati will be in Wakatobi, Indonesia for her second field season. She will be gathering data for a value chain analysis of fish species sold locally within the archipelago and regionally in SE Sulawesi and larger Asia, mapping local and regional market networks for fish caught within the national park boundaries. Paul’s field season is already off and running as he meets with his SESYNC graduate pursuit team in Annapolis to work on their research project studying hurricane impacts on social-ecological systems. In addition, Paul will be traveling to Wakatobi and Lombok in Indonesia to collect data for his dissertation. Between traveling and field work he’ll will be working on his dissertation proposal. Elle will be traveling to the 5th International Marine Conservation Congress in Kuching in Malaysia to give a talk on her work characterizing the deep-slope demersal fishery in Indonesia. Then it’s a quick stop in Jakarta to see family and back to Bali to her office with her collaborators at The Nature Conservancy to resume field work and data collection for the next chapter of her dissertation. This summer, Evans will be in Ghana to complete his field work, and clean up his data to get ready to launch into analysis mode. He’ll also be taking advantage of time at home to review relevant literature that is not readily available on the internet but found in Ghanaian libraries in hard copies, and of course to spend precious time with his family. We’ll check back in again soon with lots of pictures of this (fish) frenzied summer. For now, there’s kelp to measure, perspectives to document, and parameters to define. Shown here: Austin understandably startled by the success of his recruiting skills. Drawing by Elle Wibisono. Coming back from summer field season and into the swing of classes during the fall semester in September can be difficult. This year we dealt with it by welcoming Melati Kaye (MESM student) and Diana Beltran (Postdoc) to the lab group!! Elle was away, otherwise there would've been many welcoming cards and drawings. We're stoked to get Melati in the lab group given her background in Indonesia as a freelance reporter for many years - she has a deep knowledge of the ins-and-outs of Indonesia fisheries. Diana comes from a background of doing fish genetics and connectivity work in the Caribbean, specifically Puerto Rico. Evans spent most of 2017 in Ghana collecting data, as did Elle in Indonesia, so the lab felt lonely, However, we finally got them back after the New Year and office morale immediately increased! We also welcomed Celeste Venolia (MS student) and Kelvin Gorospe (Postdoc) into the group at the start of the New Year - see below for their recent happenings. Congratulations to Humphries Lab alum Lauren Josephs on getting her master’s thesis published in the Journal of Environmental Management. Check it out here. Evans Arizi (PhD Student). At the moment, all coursework is over for Evans and he is focusing on collecting data for his dissertation. His research looks at the potential efficacy of seasonal and spatial closures on Sardinella populations in coastal Ghana, as well as gear interactions with the fish. Data collection for this research commenced in Summer 2017 and it is still in progress with many field assistants employed in all the coastal regions of Ghana! Throughout Fall 2017, Evans was in Ghana training the assistants to gather data. As part of the requirements for his PhD degree, Evans is preparing to take his comprehensive exams in March. For this reason, Evans has returned to URI and is studying diligently and can be found in the office or library at all hours of the day! Elle Wibisono (PhD Student). Elle was back in Bali, Indonesia, to do data collection for the first chapter of her dissertation. She had to collect catch data from partner fishers all over central and eastern Indonesia by taking photographs of their fishing ledgers (receipts or logbooks). This entailed a lot of traveling, talking with the fishers over very sweet tea or coffee. Some fishers were transparent about their catches and were very welcoming, others were less so. She got a lot of help from The Nature Conservancy (TNC) Indonesia site coordinators throughout the data collection process and is incredibly thankful for their collaboration in the project. Throughout her time in Bali, she also used the TNC Bali office for free internet and coffee and workspace (thanks Peter and Jos!). Being in Bali meant that AM cycling and swimming was back on the agenda, albeit less than usual due to travels and general busy-ness. Elle (far right) on her travels to Kasuari village. It took three days of travel by air, land, and sea! Paul Carvalho (PhD Student). During fall 2017, Paul travelled to Indonesia to finalize his research permits and worked on his dissertation proposal. He and Austin made another trip to Indonesia over winter break and collected fish and benthic data from 20 sites in Raja Ampat, West Papua, Indonesia. Collaborators from Bogor Agricultural University joined them on the trip, and Paul learned many new fish species with the help of their seasoned field veterans. In the Spring, he is taking his last class (population dynamics) and teaching three sections of introductory biology lab. Paul plans to return to Indonesia in May and July of this year to collect data from Wakatobi and Lombok. Kelvin Gorospe (Postdoc). Kelvin spent the last few months preparing to leave Hawaii, which involved selling off and giving away a lot of his things, and being woken up by a false alarm missile attack! In the end, his shipment to Rhode Island was pretty small, only taking with him his piano, his bed, and whatever winter clothes he still owned. He also took the opportunity to go cross-country by train, stopping in Oakland, Salt Lake City, Denver, Chicago, and New York City to visit friends and family before finally settling in Providence, Rhode Island. As for his research activities, Kelvin spent Fall 2017 wrapping up his position with NOAA and the University of Hawaii. Before leaving, he managed to submit a manuscript to the journal Frontiers in Marine Science. The study, currently still in review, analyzes NOAA's reef monitoring datasets to recreate baseline biomass benchmarks of Hawaii's coral reef fish communities. 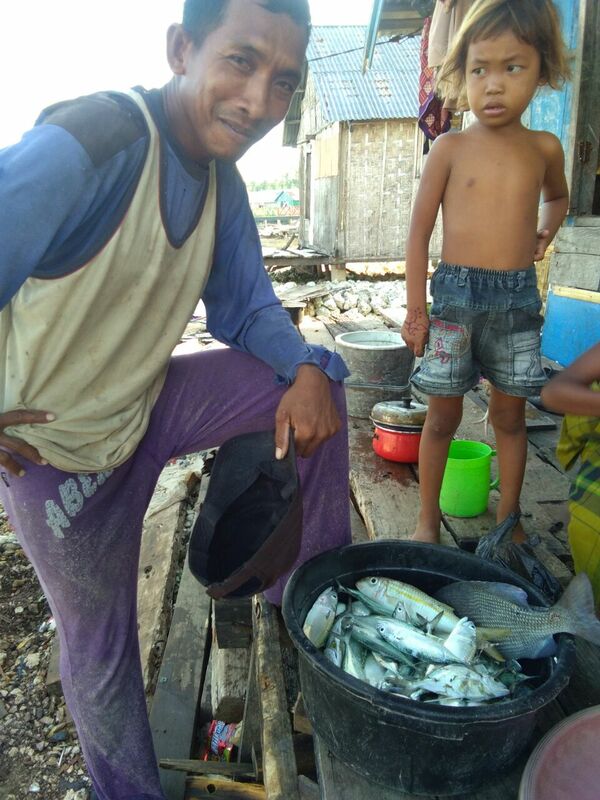 Kelvin is excited to delve into his projects of ecosystem-based fisheries management and socio-ecological analyses for Indonesia, as well as Narragansett Bay. Diky Suganda (MS Student). In December, Diky continued his research, titled “The impact of fisheries management on coral reef fish communities and life-history characteristics in Sunda Banda Seascape.” The time series data is provided by WWF Indonesia. This study is expected to increase our understanding of the impacts of no-take zones to fish community structures and life history characteristics on coral reefs. Diky spent the fall and winter struggling to analyze the (large) dataset, which has proven to be interesting (but also frustrating). Melati Kaye (MS Student). Fall was Melati’s first semester at URI; she got started with coursework and preparations for research. Over winter break, Melati was in Indonesia to process permits and set up a field site in Wakatobi. In coordination with the Southeast Sulawesi-based Universitas Halu Oleo (UHO), Melati started gathering a year’s worth of fish landings data across gear types in Wakatobi National Park. While in Sulawesi, she also met with the UHO Bajau sea gypsy student union. Katie Viducic (MS Student). In the fall, Katie continued to volunteer with NOAA-NMFS, cataloging samples and recording data from the shark samples collected during the summer months. Katie finished verifying all of her data for her thesis and began exploratory analysis. Over winter break, Katie enjoyed the cold weather and went snowboarding in her spare time. She began the writing process for her thesis and continued working on data analysis for the over 800 blue sharks that make up her dataset. Katie will defend her thesis this summer, so she is busy busy! Diana Beltran (Postdoc). Fall 2017 was Diana’s first semester with the Humphries Lab! Diana reviewed all fish-related literature on environmental DNA (eDNA) and is working on a review paper of the topic. 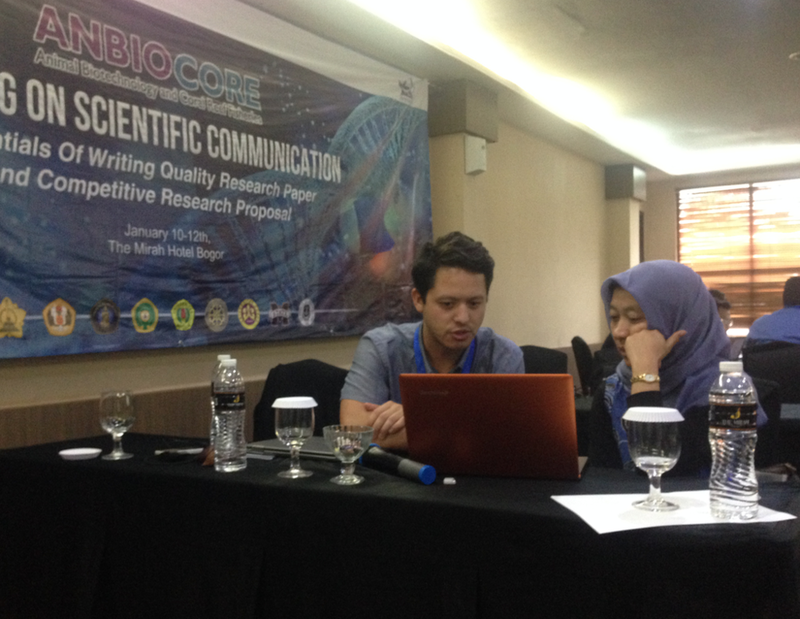 She and Austin are also thinking about future projects and where to find funding to generate baseline genetic information for coral reef fishes around Indonesia. This baseline data would serve as a database to infer variation in community structure when using eDNA and could be used to ask lots of interesting food web and fisheries questions in the Coral Triangle region. Celeste Venolia (MS Student). Celeste officially joined the lab in January 2018 after spending Fall 2017 teaching at The Ecology School in Saco, Maine. During her winter break, she spent time reviewing R code and doing some preliminary literature review. She is excited to dive into Dynamic Energy Budget (DEB) modelling to study kelp and oysters in integrated multi-trophic aquaculture systems around Rhody as part of a NOAA Saltonstall-Kennedy project. Austin Humphries (Assistant Professor). Austin taught a new course for undergraduates called "Food from the Sea" (AFS 105G) which went off well and kids were stoked to learn about fisheries and aquaculture; numerous students with no background in ocean sciences became interested in ocean food production and its history in New England. Austin gave talks at the ICES conference in Florida as well as the CERF conference in Providence, covering for Lauren Josephs (sick) and Paul Carvalho (field work). Fieldwork for the kelp aquaculture project began, and he also spent two months in Indonesia getting the USAID project up and running. This included teaching workshops, dealing with research permits, and spending a few weeks in Raja Ampat collecting data and having fun underwater. You can check out those adventures here: https://www.youtube.com/watch?v=QuD_gom-JII. Evans Arizi (PhD Student). As part of Evans’ fieldwork to understand the interaction between sardines and fishing gears, he recruited and trained field assistants for gathering data from eight fishing communities along the entire coast of Ghana in West Africa. In August, Evans was dedicated to carrying out the first official sampling for his dissertation research. He will spend the Fall semester in Ghana collecting data, reviewing literature related to his dissertation, and begin studying for his comprehensive exams. Elle Wibisono (PhD Student). Elle is back in the The Nature Conservancy's Benoa Fisheries Station (in Bali) with Drs. Peter Mous and Jos Pet, which means debating about details of the project and doing all they can to make it better. 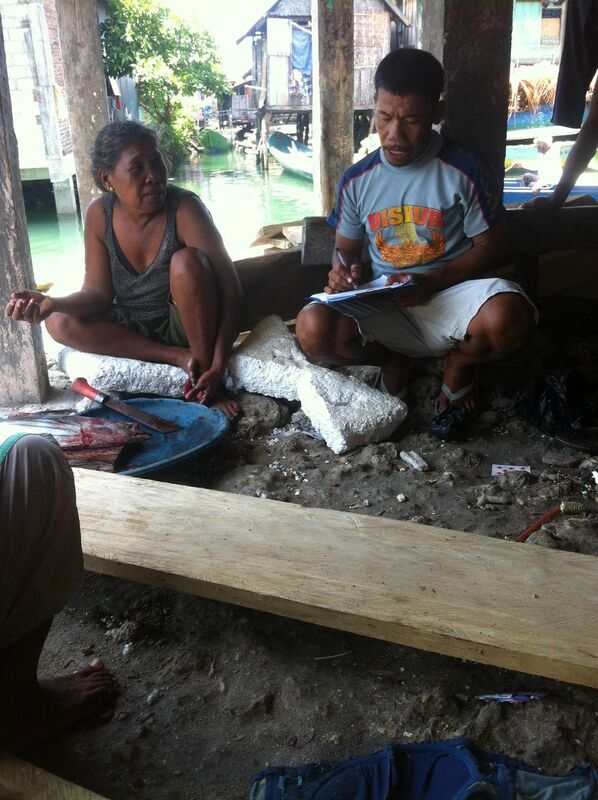 Elle has been collecting fishing ledgers from captains and fish traders across Central and Eastern Indonesia. She was unsure how successful this endeavor would be because she was asking captains and fish traders for their bookkeeping. But, for those who actually kept records, Elle and colleagues managed to take pictures and collect data. Obtaining the ledgers mainly involves smiling, a lot, and drinking sweet tea, a lot. Even when the captains and traders did not have ledgers to show, Elle always learned something new while talking to the captains.Elle is spending the Fall semester in Indonesia to continue collecting data and work on finishing the first chapter of her dissertation. Paul Carvalho (PhD Student). Paul went to Indonesia for the first time this summer to scope study sites for his dissertation research. Due to complications with the never-ending research permit process in Indonesia, Paul spent a week at Bogor Agricultural University working in an office, then traveled to Wakatobi with Austin and Melati to conduct preliminary surveys on reefs on Wangi Wangi, Kaledupa, and Hoga Island. In addition, the National Socio-Environmental Synthesis Center (SESYNC) funded Paul’s Graduate Pursuit team to examine ecological responses to hurricanes, and social/governance systems attempts to transform the qualitative state of coastal ecosystems before and after a hurricane. During Fall semester Paul presents at the Coastal & Estuarine Research Federation conference in Providence, RI, hopes to complete the research permit process, return to Indonesia to collect data for his dissertation, and meet with his SESYNC team in Annapolis MD. Diky Suganda (PhD Student). Diky spent the summer studying for his comprehensive exams, entering fish landings data from Raja Ampat, Indonesia, and directing a group of enumerators in Raja Ampat for collecting data. Also, Diky harvested tomatoes, parsley, basil, and eggplants from his small garden. This Fall Diky is going to focus on writing his thesis and look for short training courses and workshops to expand his skillset. Melati Kaye (MS Student). Melati spent part of the summer in Wakatobi, off the tip of Southeast Sulawesi in Indonesia, on a scoping trip with Paul and Austin. Her focus was on fish landings data collection protocol and methods. This meant mornings spent leaping from dock to boat deck to fishmonger canoe as she learned the different players in the local fishery, and nights spent with pictures of the day’s catch and the reef fish identification guide learning the diversity of species caught. Melati landed in Rhode Island in early September to start classes. After four years of tropical living in Indonesia, she is excited to get in some leafpeeping during her bicycle commutes to campus. During Fall semester, Melati is taking Fisheries Oceanography and Advanced Ecology, sorting through initial data from Wakatobi, and refining landings data collection protocol. Katie Viducic (MS Student). This summer, Katie continued to tag blue sharks to gather migration data for her thesis. She tagged sharks 10-50 miles off Narragansett, RI, with dart tags provided by the National Marine Fisheries Service (NMFS). In addition, Katie continued to volunteer for NMFS and travel to shark tournaments throughout New England where she collected samples for diet, reproduction, age, and growth studies. This Fall semester, Katie will continue data analysis, which she started this summer, and begin writing her thesis. Austin Humphries (Assistant Professor). Austin participated in a workshop at Columbia University on “Sustainable Food Systems Thinking and Teaching – Creating a Community of Practice”. Austin appreciated learning how other professors teach themes and content related to the courses he teaches. Lauren Josephs, the original graduate student in the lab, successfully defended her thesis on what factors contribute to social success for coastal management and restoration. Next, Austin went off to Indonesia for a month, and began the trip with a talk at the US National Academy of Sciences Indonesian-American KAVLI Frontiers of Science Symposium. Then he spent some time with his collaborators at Bogor Agricultural University before getting out in the field with Paul and Melati in Wakatobi. While in the field, the Wakatobi crew (Austin, Melati, and Paul) had success in determining study site locations for collecting data on the coral reefs and fisheries catch in Wangi-Wangi, the most populated island of Wakatobi. With equipment still wet, Austin landed in Rhode Island and completed Year 2 of his kelp monitoring project in Narragansett Bay. Austin is teaching an introductory course this Fall called “Food from the Sea”, which promises to be loads of work, but rewarding. We welcome Postdoctoral Scholar, Diana Beltrán to the group this semester! Diana uses genetic approaches to study the dispersal of coral reef fishes and how this informs marine conservation and spatial planning. She is starting work in Indonesia this Fall looking at how different fisheries management strategies influence genetic connectivity of fishes. We are also excited to get really cranking on a local hydroacoustic project with menhaden, a pelagic fish that migrates to our Rhode Island coastal waters and bays, as well as the kelp aquaculture project! And last but not least, we can't wait for two new members to show up in Rhode Island at the beginning of next year, Kelvin Gorospe (postdoc) and Celeste Venolia (MS student). Kelvin will be coming from Hawaii and he specializes in coral reef fish and fisheries, while Celeste will be working on the kelp project and recently graduated from Smith College in Northampton, MA.